Yes, Republican Larry Hogan Jr. ran a smart, tightly focused campaign that helped him pull off a major upset in the race for Maryland governor. But the main reason he’s the next chief executive is that Democrat Anthony Brown blew a sure thing. Brown had two terms as lieutenant governor to put down deep roots in all the right places throughout Maryland. It never happened. Instead, he traveled constantly delivering written speeches and then driving off to the next staged event. He never bothered to familiarize himself with the people of Maryland; instead he limited his circle to elected officials and adoring civic groups. He failed to jump in and learn about what wasn’t working in the counties — and then help local leaders find a fix. He didn’t spend his vacations walking the Ocean City boardwalk meeting and talking with common folk. He didn’t spend his time in Western Maryland getting to understand the unique problems of this isolated, mountain region in chronic need of a helping hand from Annapolis. He didn’t tour Baltimore City and its vast suburbs to find out what was on people’s minds. He was as alien to them on Tuesday as he was eight years ago. Brown started with a huge lead and everything in his favor. He breezed to an easy primary victory. Then he disappeared for the entire summer. That’s when he should have cemented his relationship with local Democrats, hit every carnival, parade, crab feast and bull roast in sight. Preaching at Sunday services isn’t enough. You’ve got to show your face everywhere and press the flesh. You’ve got to work up a sweat and convince people you’d make a great next-door neighbor. By delaying his campaign till the fall, Brown lost his momentum. He should have used the summer to organize a statewide tour featuring the full Democratic team — Brian Frosh running for attorney general and Peter Franchot running for comptroller. He also needed to turn the losing primary candidates, Doug Gansler and Heather Mizeur, into surrogate campaigners. Brown never gained the trust of Gansler and Mizeur voters because he didn’t bother to try. Hogan emerged from the Republican primary with little money and low name recognition. But no matter: Brown rode to the rescue by giving Hogan millions of dollars’ worth of free advertising. Instead of ignoring Hogan — and letting him struggle to raise his visibility — Brown spent most of his advertising budget denouncing Hogan as a “dangerous Republican.” Hogan’s face was plastered on TV ads. When it turned out that Brown’s charges were bogus and inherently dishonest, this sleazy tactic backfired. Brown ended up wasting his ad dollars, offending voters and promoting Hogan while not telling voters anything about himself. Brown’s first job was to tell the electorate about Anthony Brown — in his own words. Repeatedly. With emotion and real feelings. Instead, Brown bombarded the air waves with ruthlessly hostile, negative ads — flagrantly false — about Hogan. The Republican got all the attention, not Brown, who continued to remain a question mark to Democratic voters. When Hogan turned out not to be Darth Vader but instead a friendly, mild-mannered Rotarian, Brown’s attack ads lost all credibility. They were unethical. This turned off Democrats and independents. It was a gigantic mistake. Brown badly needed Gov. Martin O’Malley on the campaign trail from June through October. Yet Brown never capitalized on O’Malley’s magnetic personality and hands-on approach to campaigning. Since Brown proved unwilling or unable to articulate what the two had achieved in eight years, what better spokesman for the O’Malley era than the governor himself? But once again, it never happened. O’Malley was the invisible man in the campaign. Brown got hammered on O’Malley’s record, yet there was no one mounting a persuasive defense. The surprise of the primary election was Democrat Heather Mizeur. Young and progressive voters flocked to her ultra-liberal crusade. After she lost, she volunteered to campaign for Brown — only to receive a polite snub. Her supporters lost interest. Many didn’t bother to vote in November. The opportunity to spark interest in the Brown campaign among young progressives was lost. Brown let his campaign gurus call the shots — even when the moves made no sense. They isolated Brown from the common folk, from the media and from any human contact that wasn’t carefully scripted. Brown is a Harvard grad with 16 years of political experience. Yet he was muzzled and insulated from the retail side of campaigning. That’s where a candidate reveals his human side. Voters need to glimpse a candidate’s humanity. He compounded this sin by excluding his own voice from nearly all campaign ads. He never got the chance in his ads to personally address voters with genuine, heart-felt words. Brown’s strategy was to win big in Baltimore City, Prince George’s County and Montgomery County. He largely ignored everywhere else. Yet he needed to spend lots of time impressing Democrats in all the outlier counties where Republicans dominate. When he failed to cater to them, they drifted over to Hogan — or didn’t vote. He lost precious Democratic support not only in rural counties but also in big jurisdictions like Anne Arundel, Harford, Howard and Baltimore counties. Hogan won those counties by giant margins in large part because Brown didn’t offer much competition. Just as Brown snubbed Mizeur, he also gave the back of the hand to local Democrats badly in need of help in their local campaigns. Other politicians pleaded with Brown’s camp to set up small-scale events in their districts that generate enthusiasm. They, too, were rebuffed. Brown ran a one-man campaign focused on No. 1. As a result, many politicos didn’t go the extra mile to help Brown. To this day, we’re still not sure what Brown specifically wanted to do as governor. He spent his time attacking Hogan rather than laying out a coherent, compelling vision that voters could grasp. Brown gave lots of reasons — most of them fallacious — why they shouldn’t vote for Hogan but precious few reasons why they should vote for him. Voters know the office of Maryland lieutenant governor is worthless. You shouldn’t put it on your resume, but Brown did. He needed instead to give voters plausible reasons to continue the reforms O’Malley started. He needed to explain what they had accomplished rather than stress his military background and service as light guv. Brown was content as lieutenant governor to play a figurehead role on commissions and committees (such as the health-care exchange) and relentlessly read prepared texts to select groups around the state. When asked during the campaign what he’d done since 2006 to justify election as governor, Brown couldn’t give a satisfactory answer. People get much of their political insights through media outlets. Denying reporters access to a candidate is dangerously counter-productive. Brown at times ran from reporters. When asked an unexpected question, he looked like a deer caught in headlights. Hogan stayed behind after the three debates, joked with reporters and responded to their queries. Brown quickly headed toward his chauffeured SUV and drove off. Politicians must romance the media. Reporters write nicer stories if they get to know and like the candidate. Editorial page editors write kinder opinion pieces about a candidate who is open and a frequent presence. 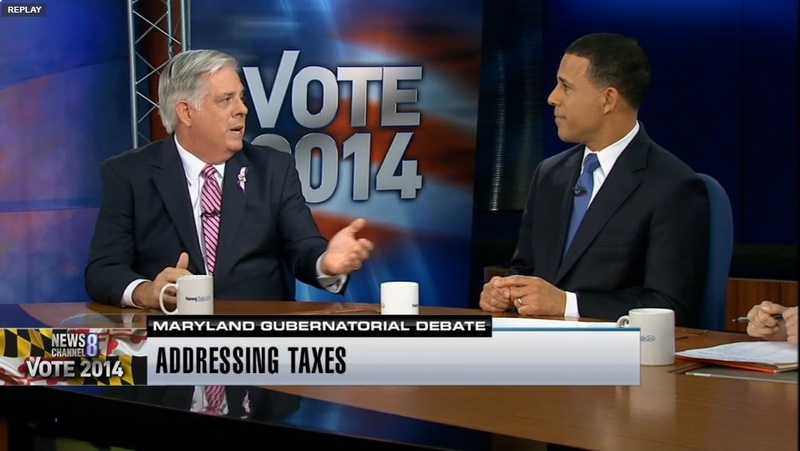 That describes Larry Hogan, not Anthony Brown. Guess who won?